With more than 70 years of experience in the Industrial Process Heating and Combustion industry, ETTER Engineering is your go-to source for the equipment your business needs to run at peak efficiency. ETTER’s families of standard valve trains were designed with the end-user in mind, blending ease of selection with quick production times to get you the equipment you need at the right price. Our valve train lines consist of complete valve trains, pilot valve trains, and valve train modules for both oil and gas, conforming to either NFPA-85 or NFPA-86, depending on your application. In addition, we can incorporate flow modules, meter modules, and regulator modules as needed, ensuring your valve train meets your specifications. ETTER utilizes components from the leading manufacturers in the combustion industry, including SIEMENS, Kromschroder, Maxon, Honeywell, Antunes and more. 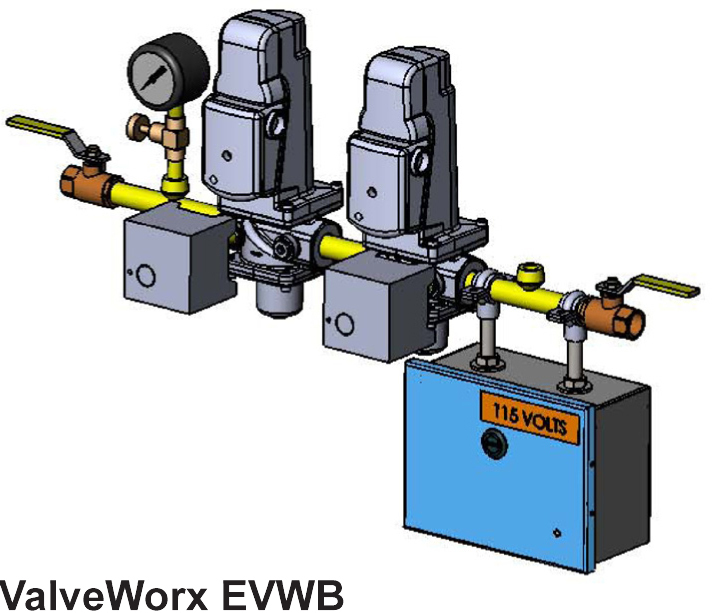 ValveWorx Basic (EVWB): Includes two manual shutoff valves, two SIEMENS Safety Shut Off Valves, and an Inlet Pressure Gauge. 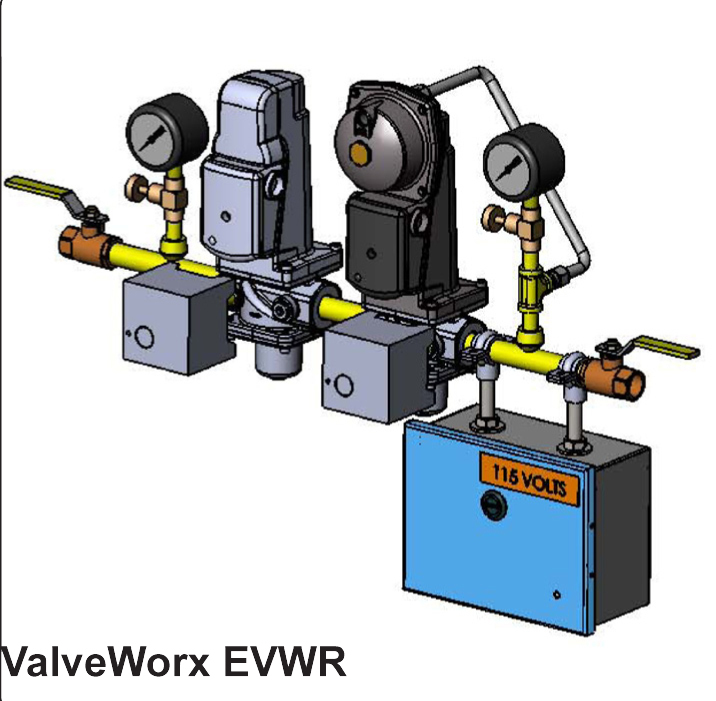 ValveWorx Regulated (EVWR): Adds an Outlet Gauge and Regulator with sensing line to the Basic package. 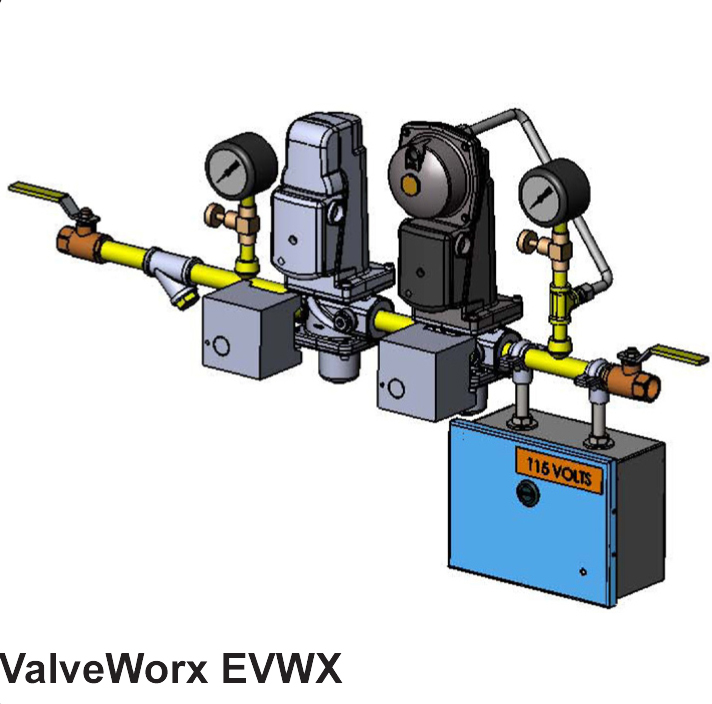 ValveWorx Extra (EVWX): Builds on the EVWR package by adding a WYE Strainer to the EVWR package. What is a Valve Train? Commercial, Industrial, and Power Generation equipment that utilizes natural gas, propane, or various grades of heating oil as the fuel source, all need and have a series of valves and control devices to control the input of these fuels in a safe, controlled manner. The design, installation, operations, maintenance, component selection and arrangement, and approval of these devices are dictated by national and International Codes and Guidelines, to insure the utmost safety, reliability, and consistency. These fuel delivery systems are commonly referred to as Gas Trains, Fuel Trains, or Pipe Trains, and typically include the Main burner and Pilot system fuel controls. ETTER Engineering Valve Trains adhere to either the National Fire Protection Agency Standard NFPA-85 or NFPA-86 covering boilers and industrial equipment. This typically includes the Gas or Fuel Oil Pressure Regulator. These components are chosen specifically by application specific data. These are Normally Closed valves that are electrically actuated to open and either allow or inhibit the flow of fuel. They are not flow control valves, as they are to be dedicated to the shut-off function. The valves will have visual indication and proved close switches for applications and sizes that require these features. These are pressure switches, for either gas or oil that are normally closed in a safe operating state, which open when the fuel pressure exceeds the switch setting. These are valves that are designed to modulate the flow of the gas or oil, into the burner. They are intended to function with the burner management system or device to maintain a desired and safe operating condition.